Welcome to the Home of "The Hitchhiker"
The Hitchhiker was HBO's first dramatic series and won eight ACE Awards to become the highest-ranking series on pay television. 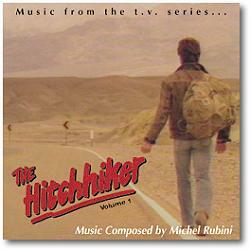 Presenting sophisticated tales of terror, horror and suspense, one of HBO's most popular original dramatic series now has the original music from "The Hitchhiker" available to sample online. Learn about the original concept and production, view the synopses of the episodes, and enjoy reading about the making of the music. Here you can listen to the original music from the series, which was written by one of Hollywood's favorite movie theme music composers, Michel Rubini, and discover his other original movie credits and best personal works.